Stephen Charrier, President of Rollerblade USA, and Rob Gill, of InlineSkates.com, review the 2015 Rollerblade Spitfire LX ALU Kids Inline Skates. Hey, I'm Rob from inlineskates.com joined today by Steven Cherrier - president of Rollerblade. Steven, thanks for being here. Thanks for having me. So, we're talking about the really cool skate in the kid's lineup - the Spitfire LX. Kind of that upgrade from the Spitfire XT in the lineup. Again some nicer features for maybe a kid that's a little better skater. Exactly, Rob. That's what the LX is all about. Best feature on this skate, like all Rollerblade and Bladerunner kid's skates, is that they're adjustable. You can see, you can slide it out 4 full sizes this skate adjusts so this particular skate is going to run for 5, 6, 7, 8... Which is an awesome feature not having to buy a new skate every time your kid's feet grow a shoe size. Exactly. It's real easy to adjust and the Spitfire, especially the LX, is just a great skate for a kid looking for a little more performance. The biggest feature is the aluminum frame. It has an aluminum frame. All performance skates throughout the Rollerblade line have an aluminum frame so naturally the LX will have it. Absolutely. Provide a little better roll, a little better power transfer. Better power transfer, higher performance feature. You also have an upgraded wheel and bearing on this skate too. It's going to make it skate faster. Really nice seamless upper on this skate. Looks a lot like our Macroblade higher end adult skates. Absolutely. Which is really cool, I think, for a kid using this skate, maybe skating with mom and dad and have a skate that looks like dad's skate too. It's going to be faster and this skate will skate. You could go out and skate distances on this without a problem. Absolutely. And one of my favorite features on the kid's skates from Rollerblade is a quick lacing system. Yeah, it's fairly easy to put on. You have a buckle on the top, a power strap that secures the skate then you have a lace lock here; lacing system you just pull it out and lock it right down. Perfect. Which is super easy for mom or dad or... Exactly, the idea is that mom and dad are not involved in the lacing of putting this skate on. Exactly. Absolutely. Keep it simple so...really nice. This is the top of our line for kid's skates and skates really well. Great support through the Spitfire structure on this skate. It's a really high quality product. For sure. 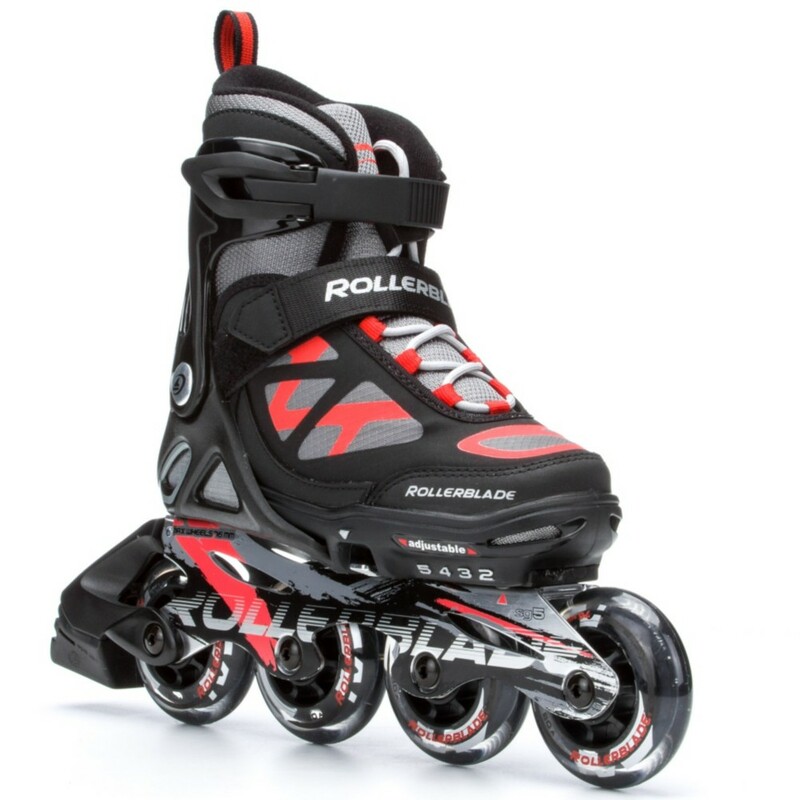 So there you have it - the Spitfire LX from Rollerblade. That upgrade kid's skate for maybe a kid with a second pair of skates. Really cool skate in the Rollerblade lineup. Check it out on inlineskates.com.